Kusadasi is a resort town on Turkey's Aegean coast, built for tourism. The town itself is pleasant and relaxing there are some impressive historical sites nearby. Kusadasi is also close to beautiful beaches and natural features. Nearby is Ephesus, an ancient Greek city, and site of one of the original seven wonders of the world, the Temple of Artemis. Ephesus's site was first populated 8,000 years ago. The Doubletree by Hilton is one of the best 5-star hotels in Kusadasi. The hotel stands out as one of the best-located accommodations in the city. Situated right on Ataturk Boulevard and within a stone’s throw of the new marina, it’s the perfect spot for visiting the beach and the town and for getting out of the city to the many places around. Grab a taxi right outside the door and bypass the crowds to visit Ephesus, Adaland Water Park, and Soke. There’s a small gym with some weights and cardio equipment. It’s open 24 hours. I’m usually unimpressed by hotel gyms but this was a step above what I find in most hotels. There's even a trainer on hand. Across from the gym, there’s a yoga/pilates/stretching area. Great to work those sore muscles if you overdo the walking around town. 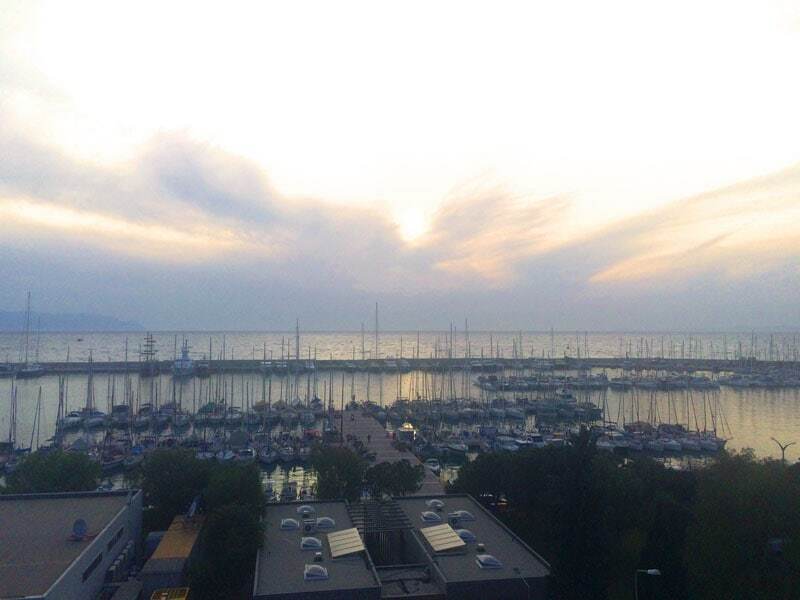 Hilton Kusadasi's competitors include the Charisma De Luxe Hotel which has a sea view pool. This beautiful pool shines in its location on the waterfront. 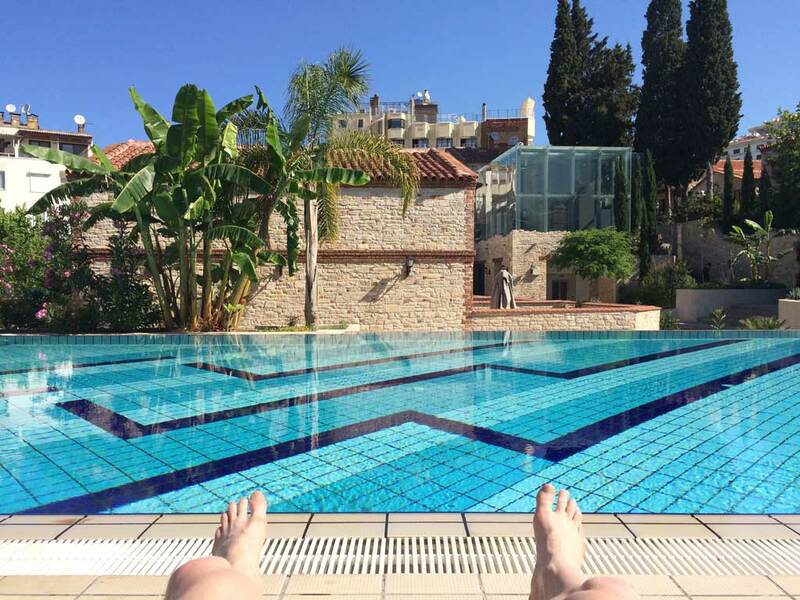 Great to dip your toes in the pool overlooking the Mediterranean but I prefer the Hilton’s main pool. The Hilton has two pools, the bigger of which is at the back of the hotel. And this is where you'll find me. Ok, so there’s no amazing view but the facility seems a lot cleaner. There are plants and trees all around and it feels a lot less busy and frantic than the Charisma’s Pool. I’m all about having a nice pool to myself and relaxing. Getting blasted with Turkish pop tunes and dealing with crowds is not my thing. The bathroom is immaculate and clean. The entire hotel lives up to Hilton standards for cleanliness. I don’t think I saw a paper out of place or an unpruned plant anywhere. 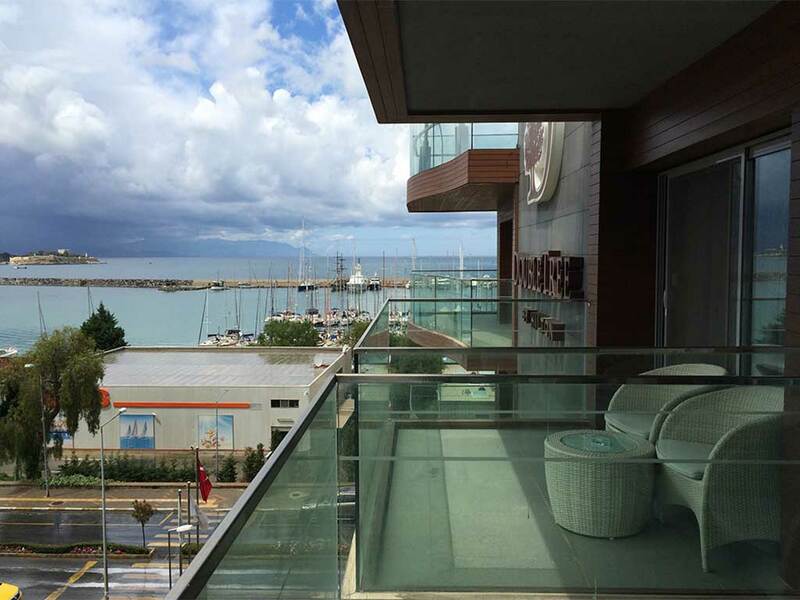 The rooms are great for the price and most have views of the harbour. The rooms that don’t have harbour views face the back of the building overlooking the pool. Large screen LCDs are standard in all rooms, although I never turn the TV on so I don't even know if they work. Too much to see, so little time for television! 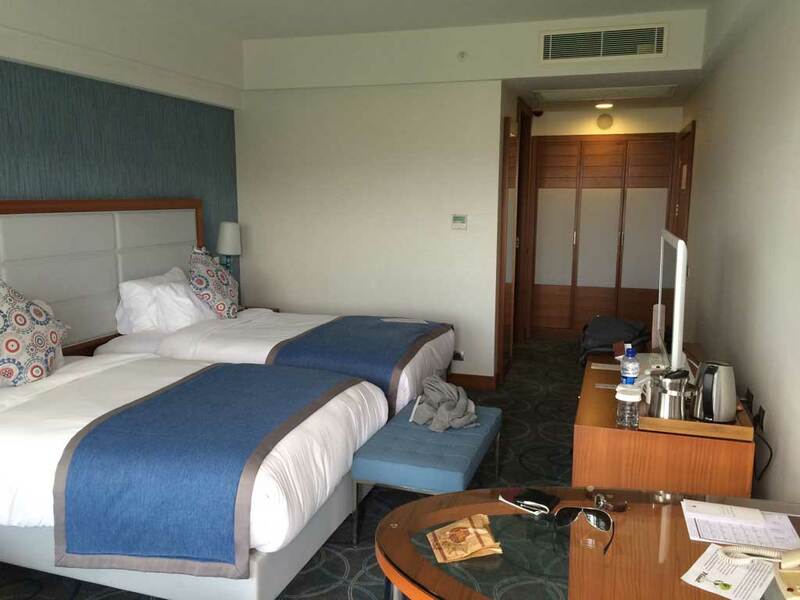 Rooms at the Doubletree by Hilton. Sorry about the mess! The beds are comfortable but I found the pillows to be next to useless. I prefer pillows that don’t resemble foot high balloons. Some people like them this way. I don’t so I slept with my head on some towels with the pillow case. It feels strange to do that in such a beautiful hotel. I realised afterwards I should have just asked the staff for a different style of pillow. While I was staying in the hotel I plugged in my iPhone charger and tripped the power switch. No power. And no access to the circuit panel so I called reception. In minutes a handyman had arrived and promptly fixed the problem. Service! 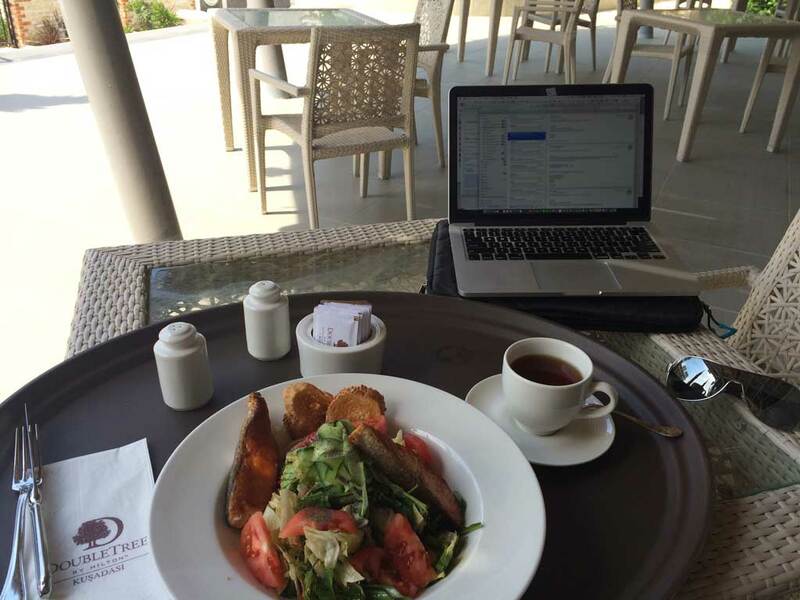 For business clients or digital nomads like me, there’s a business center with photocopying, printing, secretarial services, phone and meeting room services. One small quibble. The internet was down for three days while I was staying at the hotel. The Internet in Kusadasi (and Turkey) is not great so when you haven’t got access at your 5-star hotel it’s a mission to find decent Wifi around the city. Kusadasi has Starbucks-clones but the speed is poor even in these tourist-target places. The staff did their best to let me know about it and seemed concerned but I don’t think they understood quite how much I need fast internet to run my business. A thing that stands out for me about the DoubleTree Kusadasi is the breakfast buffet. I love buffets. That’s not to say that I don’t like a great three-course meal at a fancy restaurant. I do. But I’m also quite hungry (a seemingly permanent condition) and enjoy good food. But I eat healthy foods in general and nothing in excess. The buffet has everything I wanted: scrambled eggs, fried eggs, omelettes, poaches eggs, and boiled eggs. There's smoked salmon, which gets a big thumbs up from me. Salads, fruits, and breads of all kinds. Cold meats, cooked breakfasts, cereals and much more. So much food, so little space to put it. After a tasty breakfast by the pool, under the shade of the palm trees, it’s time for a stroll down to the waterfront to let the food settle. On the rooftop, there’s a stylish restaurant and bar and I’d recommend checking it out for the views. If you’ve got a room near the top floor, then you’ll already know what it’s like. But it’s great to eat alfresco with the Mediterranean breeze blowing over you as you watch the sunset. Some things are just priceless. The food is not expensive and they have a great selection of drinks at the bar. We ordered food for 10 people and the service was as good as in any top restaurant in the world. As the sun went down the night air chilled (this was early April). The staff brought us all blankets to keep us warm as we sipped our wine. We stayed until after closing time and never felt pressured to leave the restaurant. Another thing that stands out for me about this hotel is the staff. The people at the Kusadasi Hilton are helpful and professional. Their professionalism comes out in even the smallest things. Attention to detail in all aspects. At breakfast one morning one of the head concierge’s took the time to bring some plates to my table. That’s something I’d expect only the waitress to do but there’s a definite sense that the customer’s happiness is most important to the Hilton management. Everyone gets involved. No job is too small. One customer is not more important than another. A word about Kusadasi and Turkey in 2017. There has been a drop in tourism numbers thanks to terrorist threats in Turkey starting around 2016. 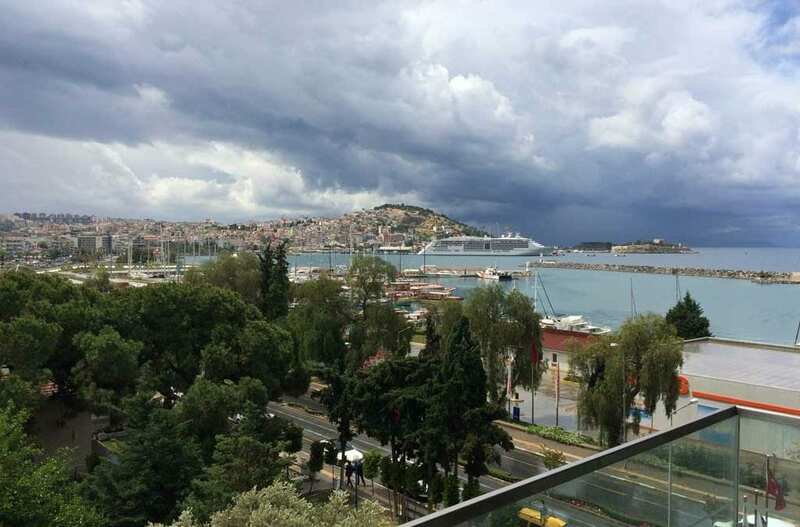 This has seriously hit visitor numbers in Kusadasi, a city that lives on the tourist industry. But the fact is that Turkey is a safe country and Kusadasi has had only one incident in the last 20 years. In fact, it’s probably safer than many big cities in Europe these days. I’ve been to the city three or four times and have always found the people very friendly towards all nationalities. If you stay at the Hilton you can be sure of the highest quality service and friendly staff as well as security for you and your belongings. With the downturn in tourism, there are deals to be had on hotel rooms, flights and activities. Check availability here. Enjoy a crowd-free Kusadasi right now as it won’t last forever! Looking for something to do in Kusadasi? Why not take a day trip to Samos? Or how about a tour of the ancient ruins of Ephesus? Planning a trip further afield? Try Pamukkale for a great 2-day trip. 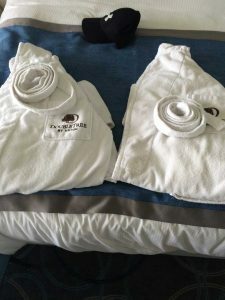 I stayed at the Kusadasi Hilton as a paying guest and did not receive compensation for this review. The opinions expressed in this article are my own.